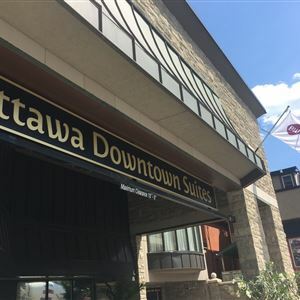 Property Location A stay at Best Western Plus Ottawa Downtown Suites places you in the heart of Ottawa, minutes from Museum of Nature and close to Parliament Hill. This eco-friendly hotel is within close proximity of Dundonald Park and Chocolate Cove. Rooms Make yourself at home in one of the 123 air-conditioned rooms featuring kitchenettes with refrigerators and microwaves. Your pillowtop bed comes with Egyptian cotton sheets. 42-inch LCD televisions with cable programming provide entertainment, while complimentary wireless Internet access keeps you connected. Conveniences include laptop-compatible safes and desks, as well as phones with free local calls. Amenities Be sure to enjoy recreational amenities including a sauna and a fitness center. This hotel also features complimentary wireless Internet access, gift shops/newsstands, and a fireplace in the lobby. Dining A complimentary continental breakfast is served daily. Business, Other Amenities Featured amenities include a business center, complimentary newspapers in the lobby, and dry cleaning/laundry services. Planning an event in Ottawa? This hotel has facilities measuring 0 square feet (0 square meters), including meeting rooms. Self parking (subject to charges) is available onsite. 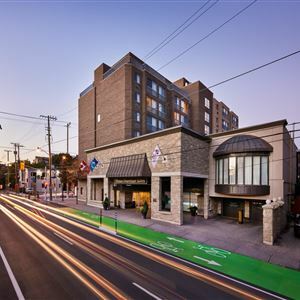 A stay at Best Western Plus Ottawa Downtown Suites places you in the heart of Ottawa, minutes from Museum of Nature and close to Parliament Hill. This eco-friendly hotel is within close proximity of Dundonald Park and Chocolate Cove. Be sure to enjoy recreational amenities including a sauna and a fitness center. This hotel also features complimentary wireless Internet access, gift shops/newsstands, and a fireplace in the lobby. Featured amenities include a business center, complimentary newspapers in the lobby, and dry cleaning/laundry services. Planning an event in Ottawa? This hotel has facilities measuring 0 square feet (0 square meters), including meeting rooms. Self parking (subject to charges) is available onsite.